News & Notice-BioSpectrum's new active ingredient Eosidin wins ITEHPEC Innovation Award at in-cosmetics Latin Ame..
BioSpectrum's new active ingredient Eosidin wins ITEHPEC Innovation Award at in-cosmetics Latin Ame..
Sao Paulo, September 26, 2017 – Clariant, a world leader in specialty chemicals, has won silver in the prestigious annual Innovation Awards of the Institute of Technology and Studies for Cosmetics, Toiletries and Fragrances (ITEHPEC) at in-Cosmetics Latin America 2017 for Eosidin, an innovative Active Ingredient that protects skin from indoor pollution damage. The award recognizes the product's innovation, both in generating noticeable consumer benefits and in the competitive advantage it provides to manufacturing customers. 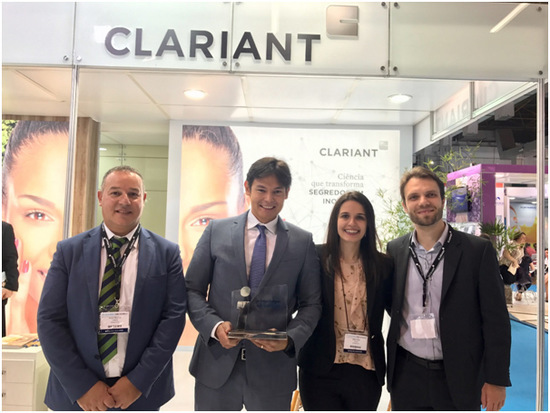 It was presented to Clariant at a special event during the in-cosmetics Latin America 2017 exhibition in Sao Paulo, Brazil, held last week. "This award is a major recognition of our team's efforts at finding innovative solutions that improve people's lives in every way, even those that are often overlooked, such as countering the impact of indoor pollutants," says Ernesto Horikoshi, Global Head of Active Ingredients at Clariant. "Eosidin is the result of extensive teamwork, close collaboration with our partner Biospectrum and our own in-depth research. Obtaining the award is made even more special for us at Clariant because it is our very first product launched in the field of cosmetic active ingredients." Clariant Active Ingredients was formed at the beginning of this year. "Having an active ingredient developed, launched and awarded in such a short time frame, bypassing well-established competitors in this highly specialized field, has provided us with a lot of pleasure and given us a strong impulse to achieve more," says Horikoshi. Eosidin was competing against 31 other products from major multinational players for the innovation award. Most importantly, Horikoshi adds, "the award shows Clariant's commitment and capacity to innovate, re-invent and reinvigorate the personal care market."